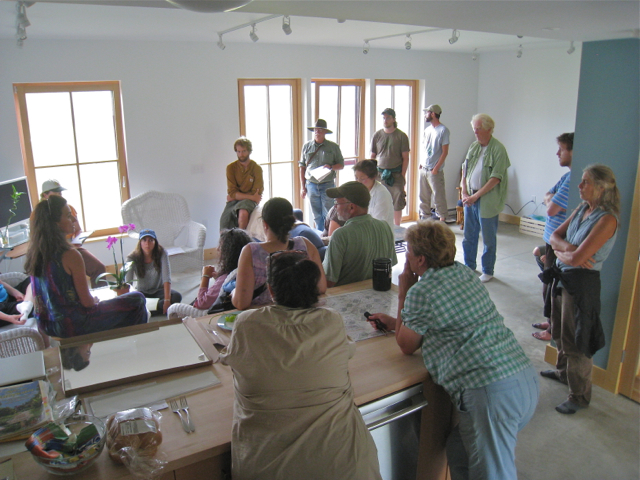 Belfast Cohousing & Ecovillage has grown quickly since breaking ground in the fall. As reported last Wednesday on Maine Public Radio, nine out of 36 homes have already been completed, and the scene already resembles the "friendly and sociable" village predicted by the Bangor Daily News and featured in the BBC, WCSH TV-6, and WABI TV-5. Entitled "Idealism Meets Reality," Jennifer Mitchell's MPBN story takes stock of this innovative community project. It certainly sounds like a community from simpler times. 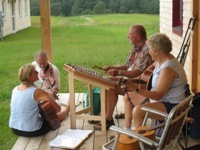 There's an informal jam session on the front porch featuring banjos and dulcimers and people singing--without a karaoke machine. There are kids on ponies, and even a teenager cutting grass with a non-motorized push mower. The scene harkens back to a time of small villages scattered along rural roads. But for all its emphasis on old-fashioned simplicity, the Belfast Cohousing & Ecovillage was built on some not-so-simple technology. The MPBN story was recorded on the occasion of last Sunday's Ecovillage Summer Festival, where Blais conducted workshops and tours of her solar-powered home to over a hundred visitors, including members of the Permaculture Design class sponsored by the Maine Organic Farmers and Growers Association. "Up there is solar hot water and photo voltaic cells," says resident Jon Ippolito. "We've turned off our grid right now. We can power it up if we want, but right now all the water coming into this house and all the electricity is powered by the sun." Ippolito and his family are in the process of moving themselves to their brand new, super-energy efficient home on the 40-plus acre village site in Belfast. Ippolito says that they were all expecting the move to require a few adjustments--perhaps even sacrifices. So far, they've been pleasantly surprised. "Our teenage son took the second of three showers the other day when we inaugurated the solar system, and he said 'I can't believe it's so hot!' Because of course even I thought, 'Ah, it's going to be lukewarm, it's not coming from fossil fuels. How can it be as warm as a 'real' shower?'" Ippolito says. "Well, turns out to be warm enough that I had to crank up the cold water." In the bleak midwinter, Ippolito's home and all the others, may have to struggle a bit more to get enough of Maine's meager sun rays. But the houses, designed by Belfast based GO Logic, are unusually energy efficient. The new homeowners are expecting to be able to heat these structures with as few as 2,000 watts of electricity. That's about what it takes to run a hair dryer--or, as Ippolito quips, you can almost heat the place by doing "enough jumping jacks." The walls are packed with 10 inches of cellulose, and the German-made windows are triple-paned. According to data from the U.S. Energy Information Administration, homes and buildings are responsible for 48 percent of all greenhouse gas emissions. Finding a way to not contribute to that statistic was a major goal of the development, and so far, this piece of the project seems to have been a success. The story goes on to explain how a village can harness the power of neighbors to solve social problems. [Joline Blais says] one advantage to the village model, is that most problems--such as affordability--can be tackled by the entire community. She proposes that the village could consider creating a fund that would be available for cash-strapped arrivals to use. "Where members can borrow that money and use that to pay their houses and then pay the interest to each other. So it's basically local banking," she says. "I'm happy to do that with local banks as well, but I think keeping it in the community is even better...."
According to the builders, each owner can expect to save about $50,000 in fuel costs over 20 years. Additionally, the communal lifestyle means that people can share significant expenses, such as farm equipment and transportation. That's something that means a lot to Sarah Gregory Smith. "Out in Waldoboro, I can't go anywhere," she says. Smith is completely blind. She and her husband Bill will be moving to their new home at the village next spring, which she says means a lot more freedom for her. If she needs a ride somewhere, there are multiple people who can help her out. "And I have my own skills that I can contribute in a community like this," Smith says. "Each person contributes their skills to a whole, and, you know, we make a very beautiful and multi-faceted whole...."
Both Ippolito and Blais say that the lessons learned in the back-to-the-land movement of 40 years ago are not lost on them. "Really learning how to live together is one of the most important things that we didn't really get in the 60's when we first started our back-to-the-land movement," Blais says. "Most of my hippie friends who are kind of all around in different parts of Maine, many in this area, were telling me, 'We got the earth piece, we did farming, we did homesteading, we did canning, we did animals, but the really hard part is learning how to do this together in community.'" They're lessons Eco-Village developers hope will benefit future generations trying to create a more sustainable way of living. 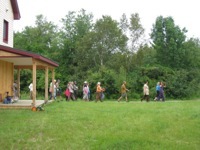 Missed the Ecovillage Summer Festival? You can also join us on Thursday 23 August for a Solar Open House at Joline and Jon's home at 78 Village Road. Specialists in active and passive solar designs--for electricity, hot water, and solar-gain home heating--will be on hand to demonstrate how these systems can cut energy bills by 90%.